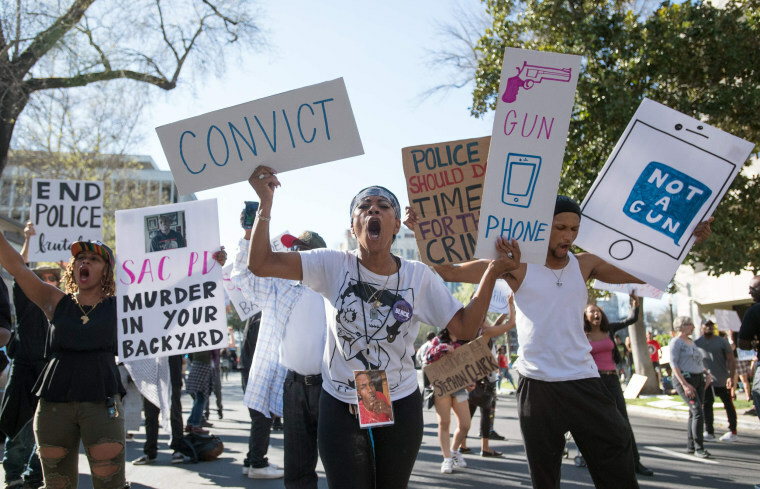 The 22-year-old was unarmed when he was shot in his grandmother's backyard in Sacramento, California. 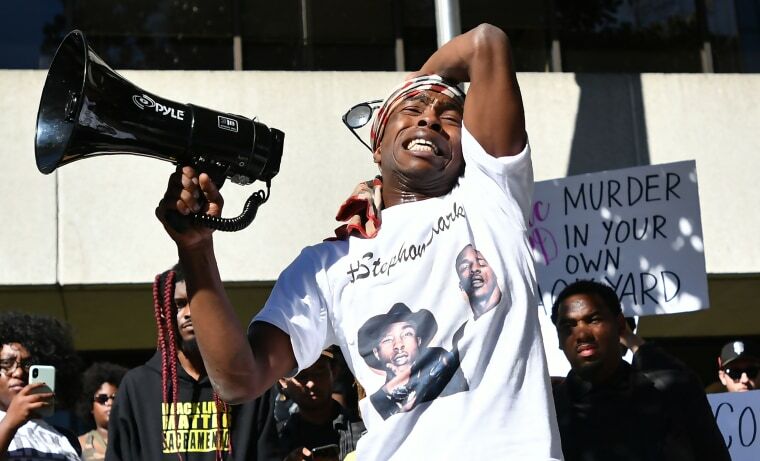 Stephon Clark's brother Stevante addresses protesters at a Sacramento rally on March 28. Police said two officers fired 20 rounds at Clark, who was found to be in possession of a cellphone, not a weapon, on March 18. Clark was killed by officers responding to reports of a man smashing car windows. Police bodycam video shows the officers chase Clark and corner him in his grandmother's backyard. 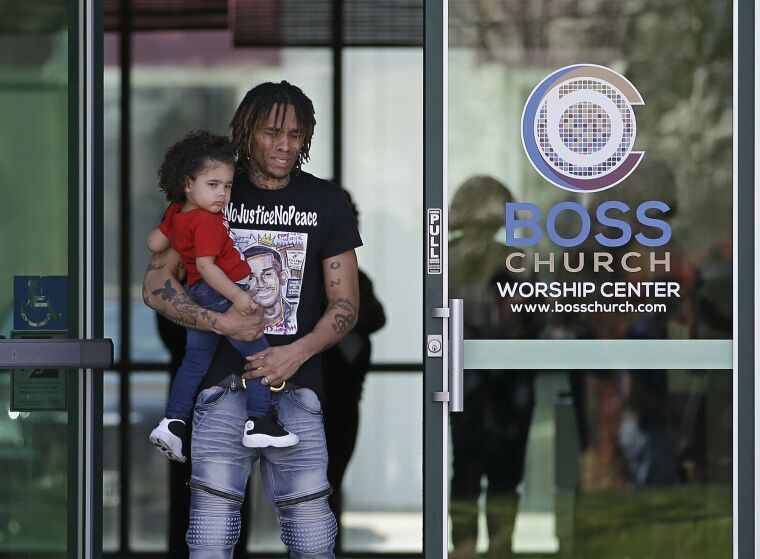 Jamarr Jones carries his daughter Amina, 2, as they leave Clark's wake on March 28. 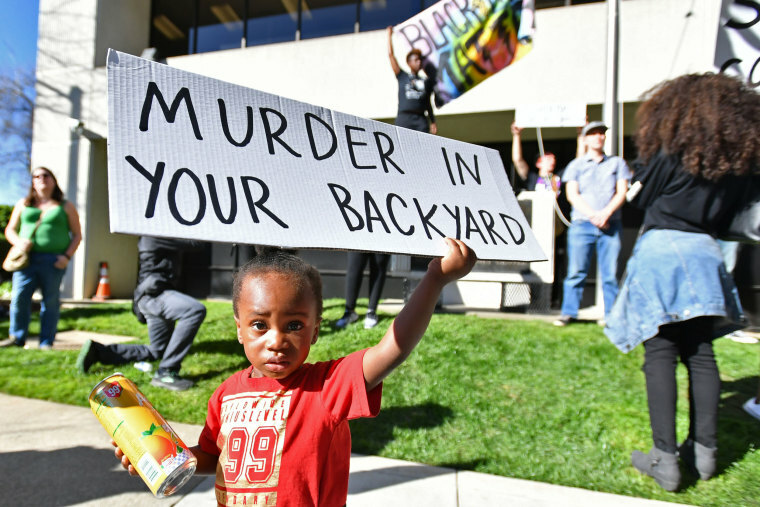 Jayceon Hurtz, 2, holds a sign at the Sacramento rally. 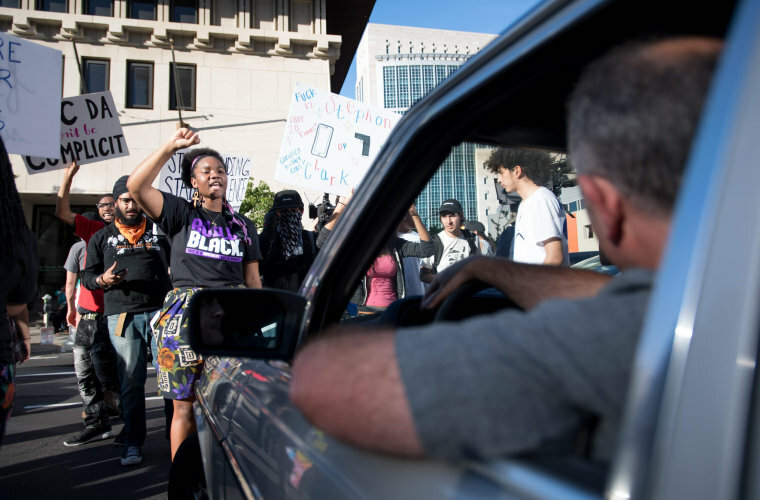 The state's top law enforcement official has said that his office would oversee the investigation into the shooting and conduct a separate review of the Sacramento Police Department's policies on use of force. 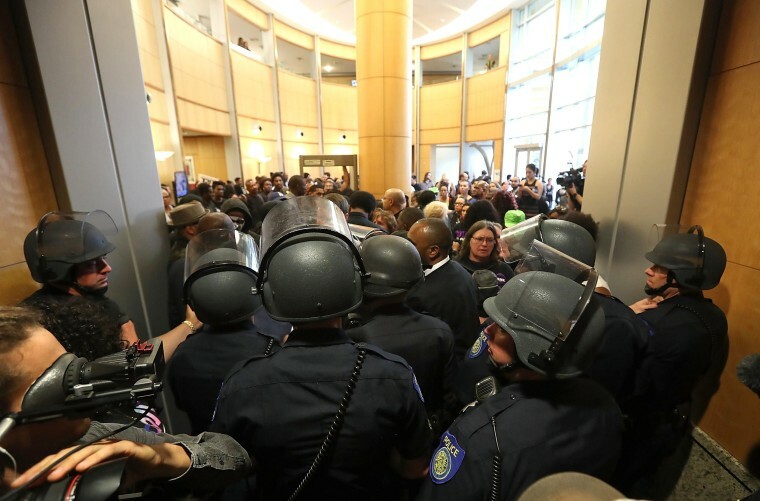 Sacramento police officers in riot gear block the entrance to a City Council meeting on March 27 that was called to address the shooting. 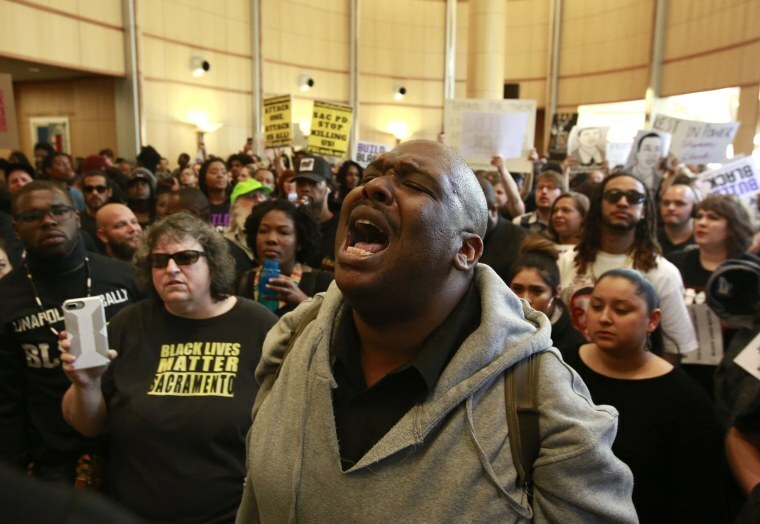 Demonstrators gather outside the entrance to the City Council chambers. 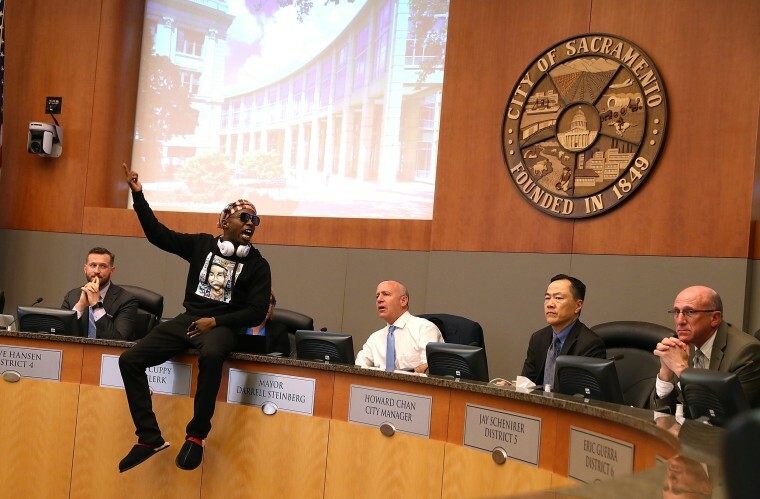 Stevante Clark disrupts the special City Council meeting. Clark hopped onto the council dais as he and members of the audience chanted his brother's name. 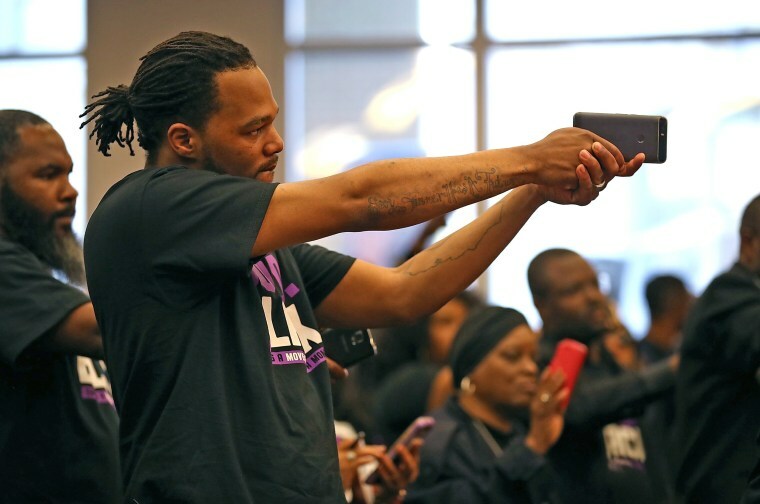 An attendee holds a cell phone like a gun during the City Council meeting. 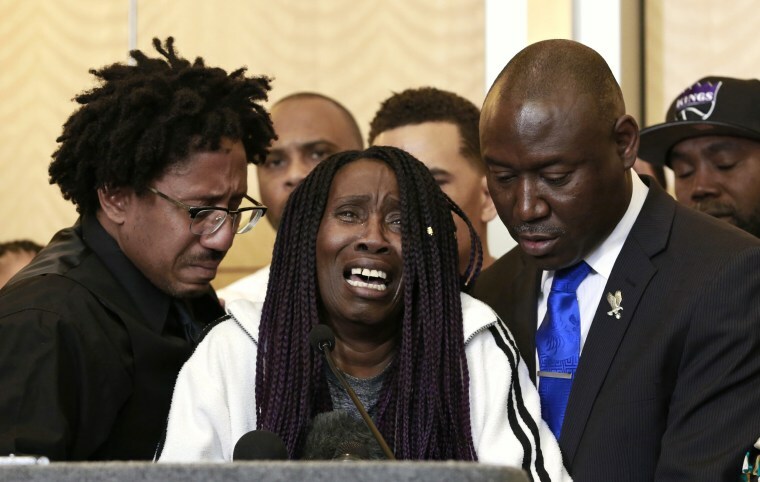 Sequita Thompson cries during a news conference on March 26 about her grandson's shooting. Thompson was accompanied by Clark's uncle, Curtis Gordon, left, and attorney Ben Crump. 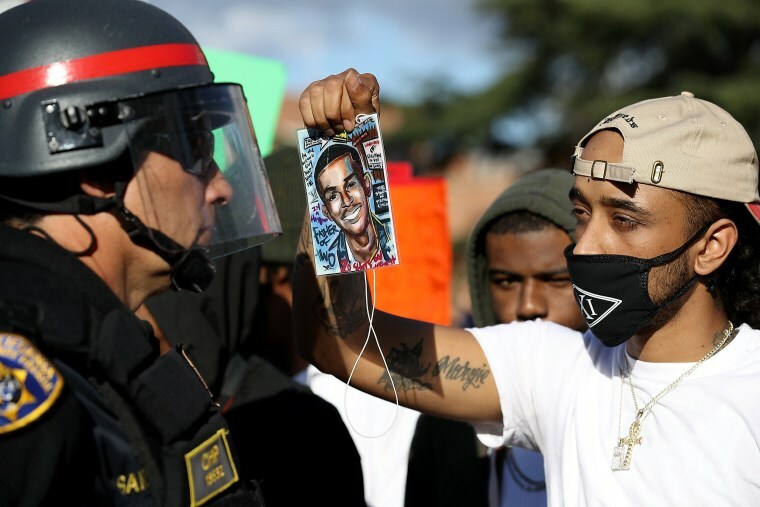 A protester holds an image of Stephon Clark in front of a California Highway Patrol officer as they block an entrance to Interstate 5 during a demonstration on March 23 in Sacramento. 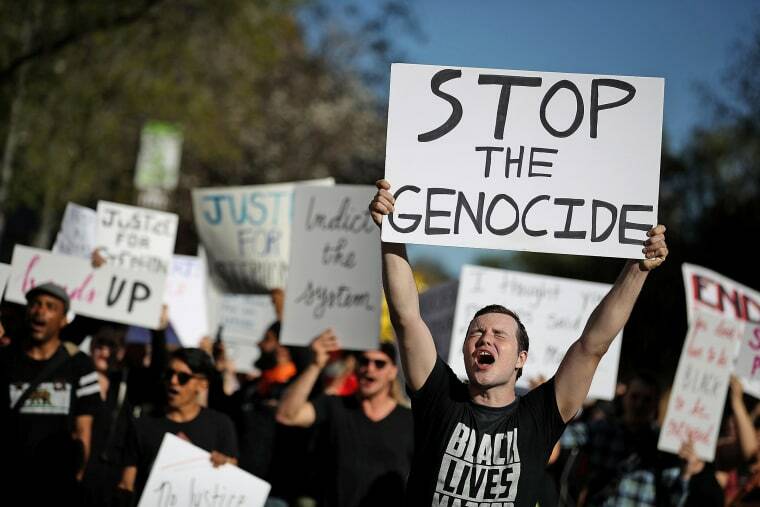 Demonstrators march in Sacramento on March 23. 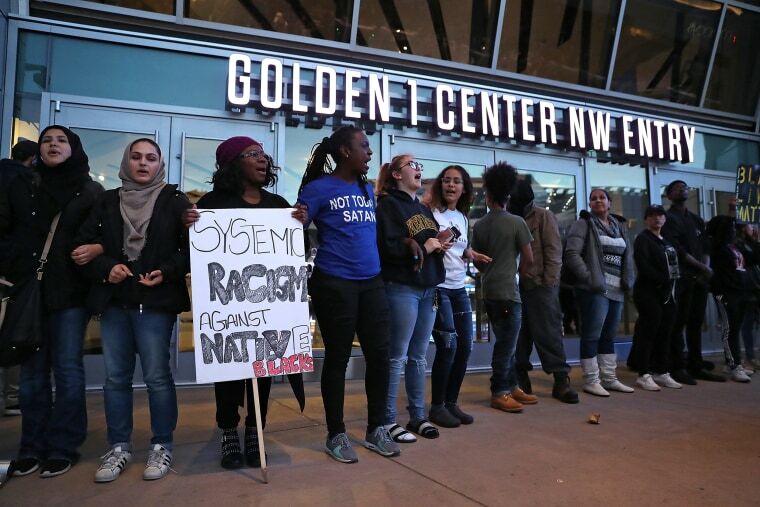 Demonstrators block the entrance to the Golden 1 Center on March 22. 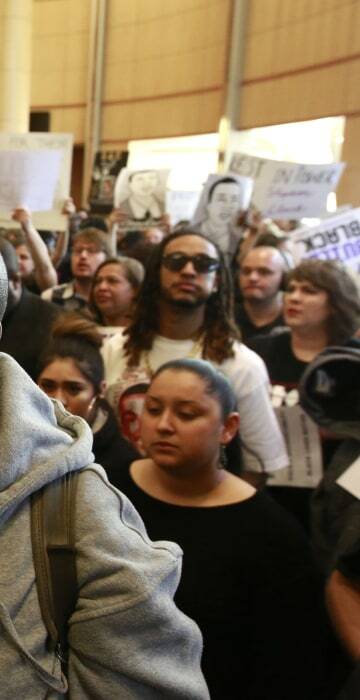 Protests have twice blocked fans from entering the NBA arena downtown for Sacramento Kings games. Stephon Clark, 22, is visible on the ground after two police officers shot him, in this still image captured from police aerial video footage released on March 21. 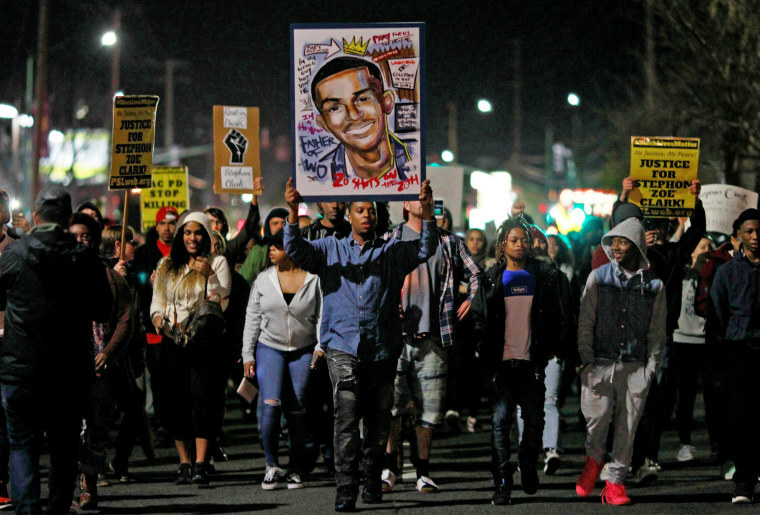 The officers say in the footage that they believed that Clark was armed; one shouts "Gun! Gun! Gun!" before the officers fired 20 times at him. 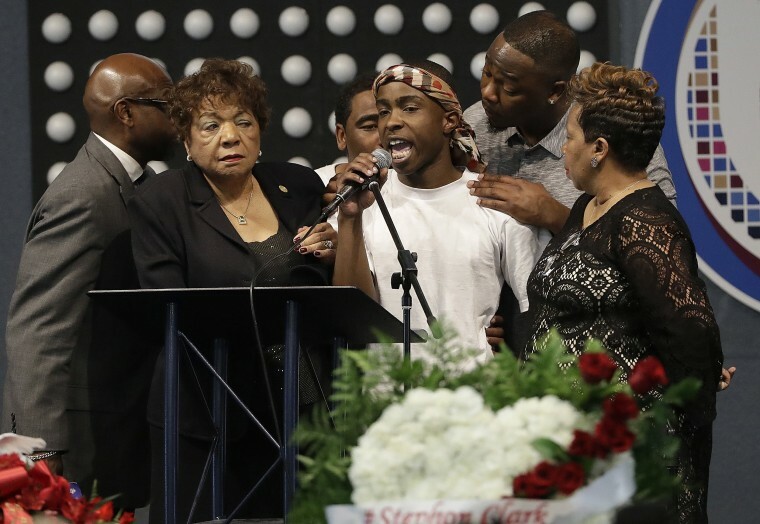 Stevante Clark, from center, speaks during funeral services for his brother, Stephon Clark, at Bayside Of South Sacramento Church on March 29. Rev. 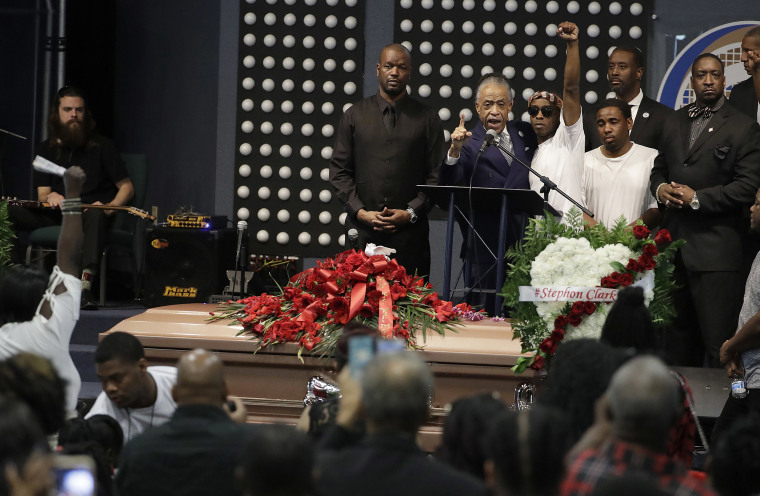 Al Sharpton, from center right, speaks while next to Stevante Clark, during the funeral services for police shooting victim Stephon Clark. 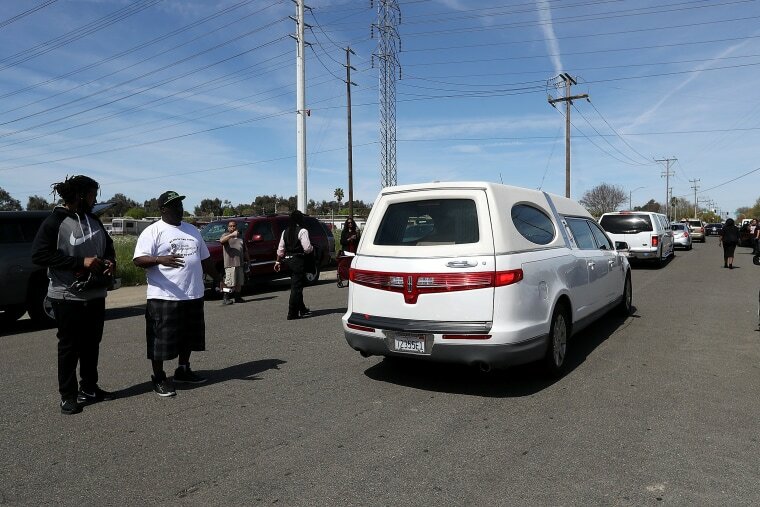 A hearse carries the casket of Stephon Clark after funeral services. 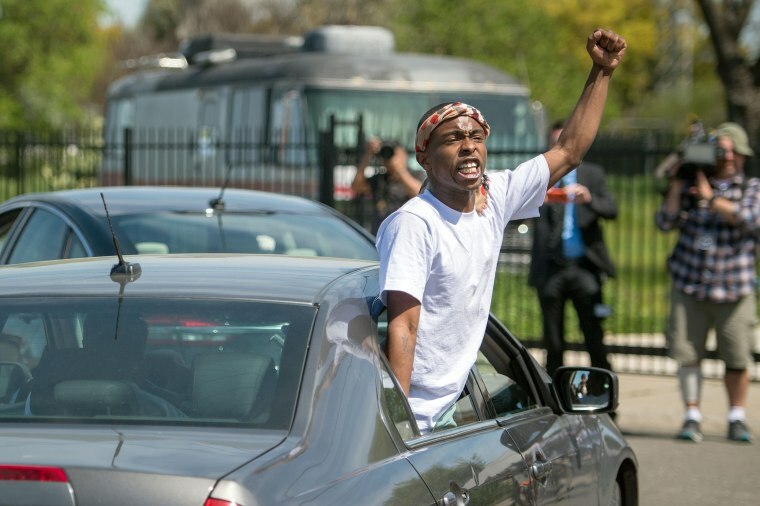 Stevante Clark shouts while hanging out of a car window as he departs his brother's funeral.